Most kids would dread the start of middle school and the year-long Explorations project that comes with it, but Ana knows that her + her best friend Lily + their plan to write and sell their own cookbook is a recipe for success. Lily’s not just the perfect partner in culinary crime—she’s also the only person in the world who understands Ana’s need to wash her hands five times before picking up a spatula, and would never make fun of her for it. But Ana and Lily’s plan for edible entrepreneurship turns into one big baking disaster when they’re assigned to different partners for their projects. As if it wasn’t bad enough that Lily seems more excited to get to know her new partner than bummed about being separated, Lily and her new friend plan to use the cookbook idea for themselves—and they didn’t even ask! 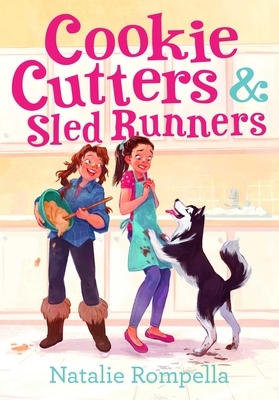 Worse, Ana’s partner is Dasher, the strange new girl from Alaska, and she wants to do their project on the weirdest thing imaginable: sled dog racing. Dasher’s dogs are scary, slobbery, and decidedly not germ-free, but Ana thinks she’s found a loophole when she agrees to bake pancakes for spectators while Dasher mushes in a local race. That is, until Dasher sprains her ankle and has to drop out of the running. Can Ana learn to mush—and overcome her anxiety—in time to save her friendships, finish her project, and compete in the big race? Natalie Rompella is the author of more than forty books and educational guides for young readers, and the winner of a Work-in-Progress grant from the Society for Children’s Book Writers and Illustrators for an early version of Cookie Cutters & Sled Runners. Just like Ana, Natalie loved baking in sixth grade, and as an adult she fell in love with sled dog racing—watching it, that is! A former museum educator and elementary and middle school teacher, Natalie lives with her family in Libertyville, Illinois.